In 337 a.d., Roman patricians on their way to Constantinople were shipwrecked along so stunningly beautiful a coast that they understandably decided to stay marooned and let war and empire pass them by. Centuries hence, the 19th century Italian writer, Renato Fucini, would say: "When the inhabitants of Amalfi get to heaven on Judgment Day, it will be just like any other day for them." For centuries thereafter—in the turmoil following the dissolution of the Western Roman Empire—Amalfi remained one of the small coastal enclaves ruled nominally by the Byzantine Empire. Finally, in 839, Amalfi was conquered by the Duchy of Benevento, itself a Longobard holdout against Byzantium. Benevento was badly in need of a port, and though there is little documentation from that period, the fact that Benevento bothered to take Amalfi at all may mean that the place had already developed into a port of some importance. Upon the death of the Duke, Amalfi freed itself from Benevento and went into business for itself. In 957, the head of Amalfi took the title of Duke, putting himself on an equal level with other rulers of the area. Little by little, the Amalfi fleet expanded and spread throughout the Mediterranean. 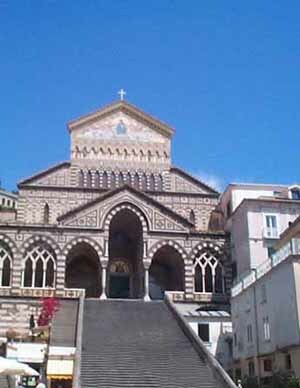 Many places throughout the Mediterranean still have small churches to Saint Andrew, patron saint of Amalfi—churches built by Amalfi seafarers centuries ago. They established a strong presence in Antioch, and especially Constantinople, where they were the single greatest group of merchants in the commerce between East and West, taking an active political and economic role in the life of the Byzantine Empire. In Constantinople in the middle of the tenth century, there was an "Amalfi Quarter," replete with schools and stores. And in Jerusalem the Amalfitans founded the Order of the Knights, which later became the famous Order of Malta. The fortune of Amalfi changed dramatically for the worse in the 1100s. Three things happened. First, the powerful Normans, who would eventually take over all of southern Italy to found the Kingdom of Naples, took the city in 1131. With that, Amalfitan independence ceased. Second, the town was sacked by the maritime competition, Pisa, in 1135 and again in 1137. Third, Amalfi failed to participate in the first Crusade, leading further to its decline, and to the rise of competing maritime republics in the north of Italy. Somewhat later, in 1343, a powerful earthquake destroyed the port of Amalfi, administering a belated coup de grace to the once proud maritime power. The current accessibility of Amalfi by vehicular traffic is due to the road-building enthusiasm of Ferdinand II of Bourbon, King of Naples, in the mid-nineteenth century, who opened a road all along the Sorrentine peninsula and over to the Amalfi coast. *note (Aug 2009) on Flavio Gioia: Alas, even “they say” may be too strong. 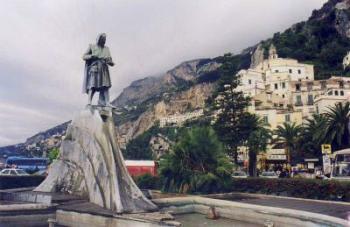 Flavio Gioia, in spite of the nice statue in Amalfi (photo, right), most likely never existed. According to at least some modern sources, the confusion arises from the fact that the medieval historian, Flavio Biondo (Flavius Biondus) (1392-1463), reported the compass to be an invention of Amalfitans. That attribution was passed on as "a Flavio dicitur"—i.e. “as Flavius says”—Flavius, the historian, obviously. A comma then gets dropped in or moved, resulting in “a Flavio, dicitur,” attributing the invention “to Flavio, so they say.” At first, he was Flavio of Amalfi; then, for no reason that anyone seems to be able to figure out, the Neapolitan historian, Scipione Mazzella, said (around 1600) that Flavio was from the town of Gioia in Puglia. Thus, Flavio Gioia. But it's still a nice statue. In any event, there are earlier references in Chinese and Arabic literature to compasses used for maritime navigation. It isn't clear whether the knowledge of the compass was passed to Europe from those sources or whether it arose independently. If, indeed, there ever was an Amalfitan invention of, or improvement on, the device remains unclear. *Note on the Italian Maritime Republics. Amalfi was one of the four Maritime Republics of medieval Italy; the other three were Venice, Genova and Pisa. 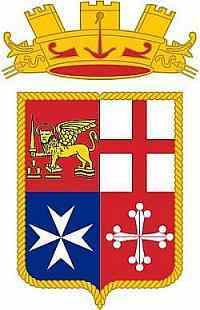 The modern Italian navy uses a display of the emblems of those four medieval republics on its flag (image, right): upper left, Venice is represented by the lion of St. Mark holding a sword; upper right is the red Greek cross (meaning that all arms of the cross are of equal length) of Genoa; lower left is the symbol of Amalfi, a Maltese cross; and lower right, a stylized cross bottony, with the points of the arms shaped like the architectural trefoil, representing Pisa. *Note on the Amalfi Maritime Code. It was also called the Tavole amalfitane, Tabula Amalphitana, or Tabula de Amalpha; Latin original: Capitula et ordinationes Curiae Maritimae nobilis civitatis Amalphe). The code regulated maritime traffic, commerce and specified how members of a crew were to behave in given circumstances, listing the rights and obligations of each crew member. The code is made up of 66 articles, called "chapters." The first 21, written in Latin, are the oldest and are dated from the 11th century. The remaining 45, written in vernacular, were added in the 13th century. The original text no longer exists, but there are extant later copies. In 1929, the Italian government purchased from Austria one of those copies said to have been the property of the Venetian Doge Marco Foscarini (doge in 1762-63). The Italian state then passed the copy to the city of Amalfi where it is has since been preserved in the civic museum in the city hall. New museum. As of 28 December 2010, Amalfi has a much-needed museum: The Museum of the Compass and the Maritime Duchy of Amalfi. The facility documents and illustrates the history of this ancient Maritime Republic; there are displays on the evolution of nautical navigational instruments as well as various artifacts and relics that go back to the founding of this City-State in 839, including a facsimile of the Tabula de Amalpha, the first code of Mediterranean maritime law There are exhibits of Roman and medieval sculpture, ancient parchments, codices and manuscripts, tufa statues, portraits of personages who have entered the ‘Mythology of Amalfi’, maps of the ancient Duchy of Amalfi, and artistic costumes for the Historical Regatta. The Museum is housed in the ancient Shipyard, the principal testimony of the maritime history of Amalfi.